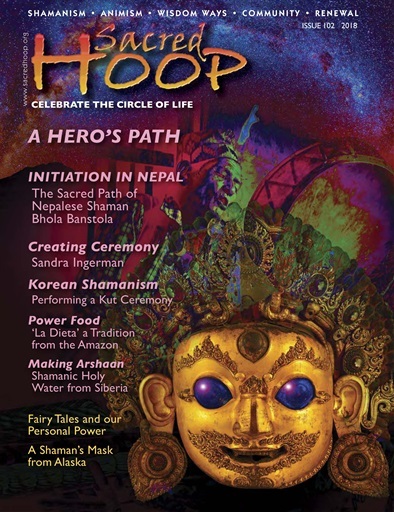 (0 Customer Reviews) | Write Review 4 issues per year Sacred Hoop, the world's leading magazine about shamanism, shows you ancient ways to enrich your life, and bring healing and a deeper creative connection with the sacred spirit of Creation. Sacred Hoop leads you into the ancient way of the shaman, traditions many tens of thousands of ways old, and explains how these traditions are a signpost to a positive future for life on planet earth, especially in this time of great environmental, social and cultural change. 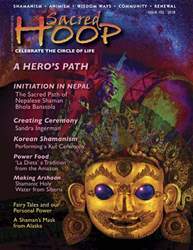 Published since 1993, Sacred Hoop features articles and interviews with the ancient wisdom keepers of cultures across the world, and connects the reader with those in the West who are bringing these ancient understandings into contemporary life, health care, community and the arts. Sacred Hoop's colourful paper or digital pages are filled with enthralling travellers tales and the traditional sacred art and healing ways of the world's tribal cultures. Each issue brings you simple but effective ways to incorporate these ancient pathways to wholeness into your own life, to make it richer, more connected and more whole-hearted. Sacred Hoop, the world's leading magazine about shamanism, shows you ancient ways to enrich your life, and bring healing and a deeper creative connection with the sacred spirit of Creation. You'll receive 4 issues during a 1 year Sacred Hoop magazine subscription. You'll receive 4 issues during a 1 year Sacred Hoop magazine print subscription.